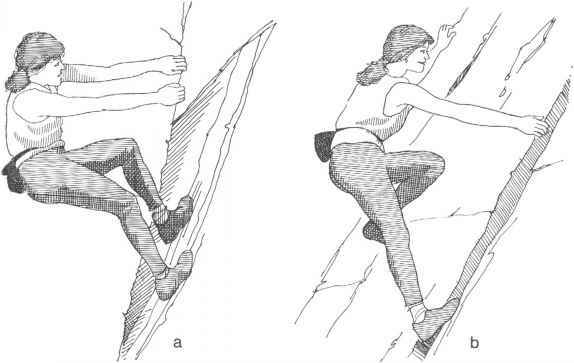 The classic lieback technique, another form of counterforce, uses hands pulling and feet pushing in opposition as the climber moves upward in shuffling movements (fig. 9-15a). It's used to climb a crack in a corner, or a crack with one edge offset beyond the other, or along the edge of a flake. Grasp one edge of the crack with both hands and lean back and to the side on straightened arms. Push your feet against the opposite wall of the crack. Then get a move on. It's a strenuous technique, and it's best to move as quickly and efficiently as possible. Keep arms extended to minimize stress on tensed muscles. The right relationship of hands and feet will vary, but it becomes easier to determine with practice. In general, keep your feet high enough to maintain friction on the rock, unless a foothold is available. But the higher you bring your feet, the more strenuous the lieback becomes. The lieback has variations. You can lieback on a single handhold in combination with other holds, or use one hand and foot in a lieback while utilizing face holds for the opposite hand and foot (fig. 9-15b). Fig. 9-15. Lieback: a, a classic lieback; b, combining a lieback (right hand and foot) with face holds (left hand and foot).